Unfortunately there is no information about Weinviertel DAC available. One of the eight specific wine regions in the Austrian state or generic wine-growing region Lower Austria, Here was already by the Celts Winegrowing operated before the birth of Christ. In the community Stillfried we found grape seeds of the cultivated vine Vitis vinifera dating back to 900 BC Were dated. That's what counts next to Burgenland Zagersdorf to the oldest viticulture communities of Central Europe. After an old trade route from Wien to the Czech Brno, the typical Weinviertel wine is Brünnerstrassler named. The north of the Danube lying, gently rolling area adjacent to the north Czech Republic and extends from the Manhartsberg in the west to the border of the Slovakia in the East. 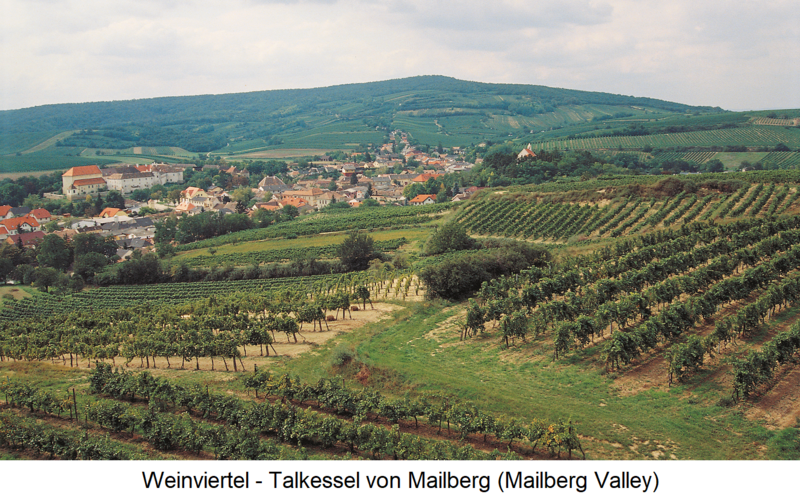 The Weinviertel is not a closed area, but consists of many, sometimes small vineyard islands. It used to be divided into two separate areas. 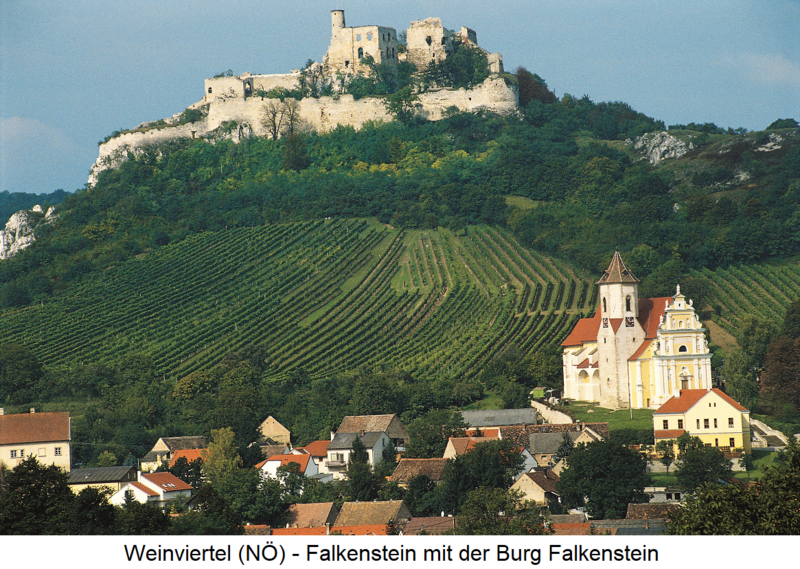 The eastern area Falkenstein starts in the south near by Wien, The most important viticulture communities with the most famous vineyards in Klammer: Bisamberg (Gabrissen, Jungenberg, Wiesthalen), Bockfliess, Falkenstein (Alsen, Eckartsberg, Kreuzberg, Rabenstein, Rosenberg), Enzersfeld (Sand Valley), Gänserndorf, Mr. Baumgarten, Katzelsdorf, Kleinhadersdorf (Birthal, Bockgärten, Hochenleiten), Korneuburg, Langenzersdorf, Mannersdorf, Matzen, Mistelbach, Münichsthal (Seewansche Lagen), Poysbrunn, Poysdorf (Bürsting, Hermann haggling, Kirchbergen, Saurüsseln, White Mountains), Schrattenberg, Stetten (Haidviertel, Hundsleiten, Mitterviertel, Neuberg, Zeiseneck ), Wetzelsdorf, Wolkersdorf and Zistersdorf. The western area Retz extends from Großriedenthal in the south to the eponymous community in the north. The most important wine-growing districts are Eggenburg, Frauendorf, Haugsdorf, Hohenwarth, Hollabrunn, Kleinhaugsdorf, Limberg, Maissau, Muhlbach am Manhartsberg, Ravelsbach, Retz with Oberretzbach, Mitterretzbach and Unterretzbach ( Altenberg, Klafel, Satzen, Züngel), Röschitz, Ruppersthal, Schrattenthal, Sitzendorf and Ziersdorf. The vineyards of Mailberg with the vineyard Hundschupfen forms a climate-proof island. The Weinviertel soil types are of course very different due to the very widespread area, but loess, clay, primeval rock and black earth soils dominate. The climate is continental, only in the extreme east there is a Pannonian influence. The summers are mostly hot and dry and the winters cold. The vineyards are between about 200 and 250 meters above sea level. The best vineyards are located in locations with particularly favorable microclimate, that is Bisamberg, Falkenstein, Mailberg and Retz. 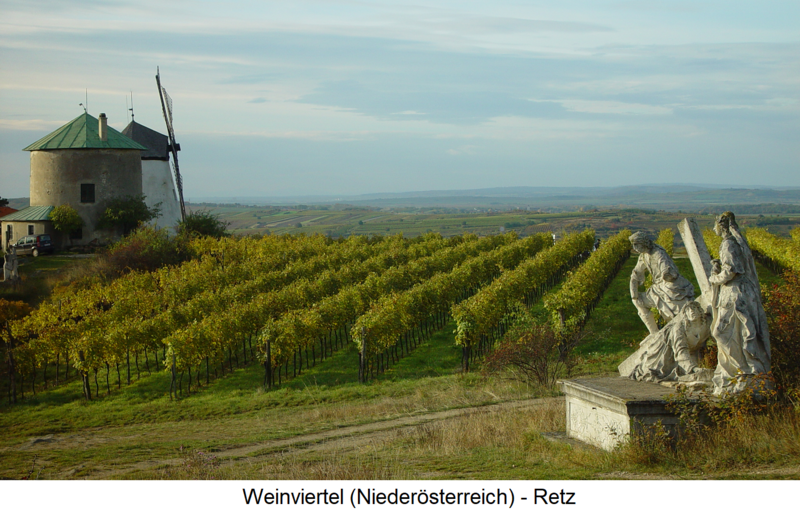 In 2001, the Weinviertel Weinviertel was founded to promote wine and cultural tourism. Over a distance of over 130 kilometers, 150 communities with more than 500 vineyards are involved. In 2015, the vineyards covered 13,858 hectares of vineyards. 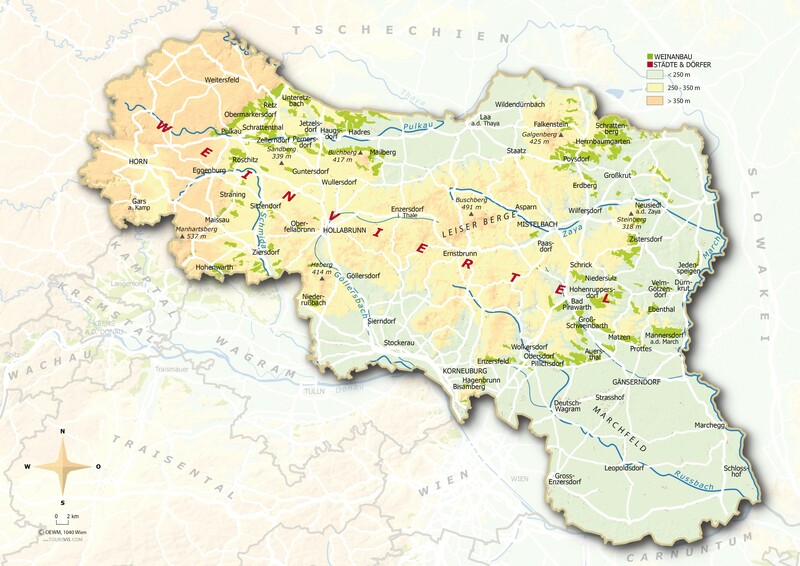 With around 30% of Austria's total area, the Weinviertel is by far the largest winegrowing area. This was almost identical to 13,356 hectares in 2009. The proportion of red wines is 24.4% and the proportion of white wines 75.6%. It dominates with almost half of the Grüner Veltliner, which is why the area is also referred to as "Veltliner Land". Classic : The wine must be from the quality wine grape Green Valtellina to have been prepared. He must dry with a maximum of 6 g / l residual sugar be developed (standard for dry would be 9 g / l). The alcohol content must be at least 12% or (from the 2010 vintage) a maximum of 12.5% vol and 13% vol in exceptional years declared by decision of the Regional Committee. As typical peculiarities are a light yellow to green-yellow color, a typical varietal bouquet as well as a fruity, spicy. peppery Taste demanded. The wine may neither botrytis still wood tone ( toast flavor ) and do not taste unilaterally alcoholic. The specification of a Great location is not allowed, as a smaller geographical units can be a municipality and a Riede be specified. An application to obtain the state test number may be made from 1 January of the year following the harvest. However, marketing in the case of a positive decision may not take place before 1 March of this year. reserve : This level for stronger wines was introduced six years later with the 2009 vintage. The wine must have a dense structure with a long finish. A delicate botrytis or wood tone is allowed. The existing alcohol content must be at least 13% vol. The bottling must be done within the production plant and in the Weinviertel. The bottles have to be specific capsule be provided. It may grapes, but not must be purchased. An application to obtain the national test number may not be submitted before 15 March of the year following the harvest. At least four out of six tasters must agree that the wine is in sensory Respects the provisions.